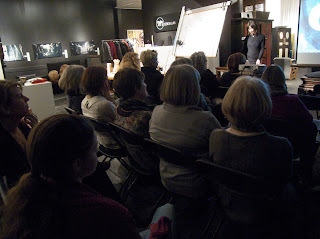 The scene on Wednesday evening at DaDe Gallery in Inglewood, the venue for our first SDA meeting in Calgary (report is below by Arlee). Thanks are in order to everyone who helped with this event. 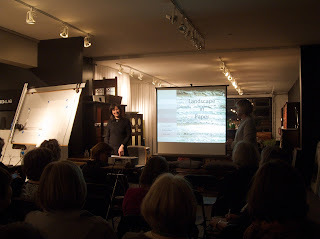 Not least our speakers who generously volunteered their time to share information from the academic to the amusing and anecdotal about their ventures into paper making from indigenous Alberta plants, more precisely plants from the Banff National Park. The Dade Gallery made for a perfect location and if you would like to present some of your work at our next meeting do let me know. 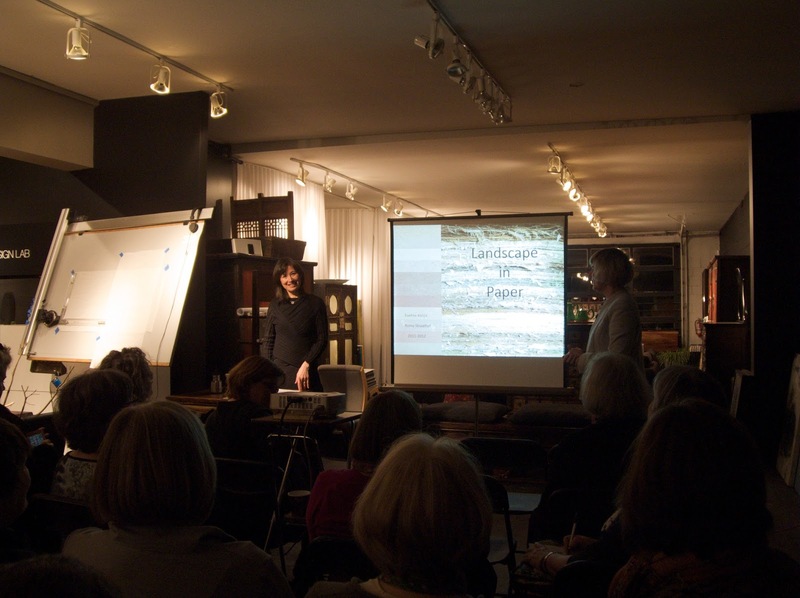 Our audience was mixed from all walks of the Surface Design spectrum and the enthusiasm we felt for the subject was aptly demonstrated as Romy and Eveline summed up their work. Thanks all for supporting this event and special thanks to Greg and Darcy who, not only gave the space up for the evening but, were not concerned by us taking over many horizontal surfaces with our samples, fliers, and snacks (thanks again to the volunteers who were so keen to feed us and did so with style. The next meeting "Swatch and Mingle" in Calgary will take place in March when the SDA Swatch collection will be available at the meeting and afterwards. The collection will be in Lethbridge for a meeting on February 12th, prior to the Calgary meeting and can travel afterwards. Please get in touch with me to arrange to host the collection if you wish.